David Saunders, formerly head coachman to The Duke of Edinburgh, Royal Mews, Windsor Castle, England and was with The Duke from the inception of combined driving, so has seen the development of combined driving right from its earliest days. Apart from that, as a member of the Royal Mews he has a great background in coaching. David was the inspiration for the book Competition Carriage Driving and the Royal Four in hand video produced by the Duke of Edinburgh and appears in all of The Dukes equine books. David was involved in the design of the open back step marathon carriage now used in competitions and has designed several harness innovations and some new driving bits. 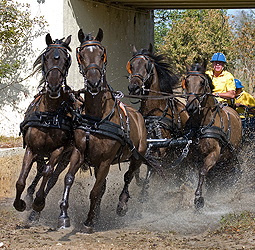 Now a citizen of the United States residing in Florida, Saunders has contributed to the growth of carriage driving in general and has represented the United States in the World Pair Driving Championship. Prior to his move to the US, he represented Great Britain in several Pair and four in hand World Championships, winning the Four-in-hand in British National Four in hand Championships1988. Since arriving in the United States, Saunders has been a member of the USET representing the US with a Four-in-hand and at the World Pairs championships. He then became highly sought after for his coaching knowledge and experience. His coaching students have included such esteemed drivers as Gloria Austin, Misdee Wrigley and Tucker Johnson. Saunders is one of a select few who is credentialed to judge sanctioned coaching events in the U.S. David's most recent achievement is Chief Steward Driving for the International Equestrian Federation (F.E.I.). David Saunders has much to offer carriage drivers in whatever field their interest lies, be it coaching, pleasure driving, or combined driving, novice or experienced. National Judge - Driving, U.S.A.
National Judge - Driving, U.K. Member of Selection Committee - Driving, U.S.E.F. Member of the Four-in-hand Club, U.S.A.
Coachman and Competitor for Jonh W Kluge U.S.
Coachman Royal Wedding Prince & Princess of Wales, U.K.
Coachman to H.R.H. Prince Philip the Duke of Edinburgh, U.K.
Coachman to H.R.H. Prince Michael of Kent, U.K. Horse master for the film and television industry U.S. and U.K. Expert witness High Courts, London, U.K. Stand in for H.R.H. Prince Philip, Trooping of the Color, U.K. Worked closely with Royalty Protection Metropolitan Police, London, U.K. Worked in horse shoeing industry, U.K.